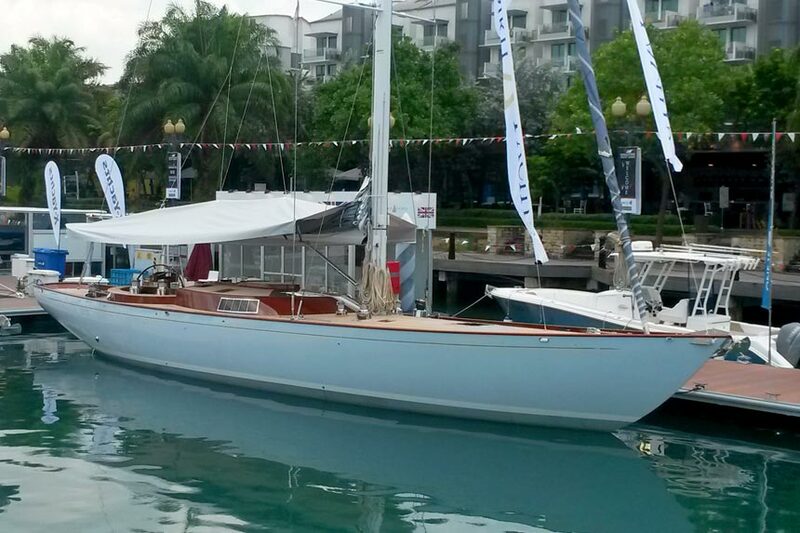 Earlier this month, the Spirit team returned from launching the stunning new Spirit 65’ Chloe Giselle at the prestigious (if a little hot and humid) Singapore Yacht Show. As well as impressing show visitors, Chloe Giselle was also the setting for a three day photography shoot in partnership with classic British clothing company Quba. Exhibiting alongside premium yachting brands from across the globe in the exclusive ONE°15 Marina Club in Singapore, Spirit Yachts welcomed visitors from across Asia throughout the four day show. With a host of fibreglass boats on display, Chloe Giselle was admired by all for her classical elegance, clean lines and beautiful wooden design and build. Spirit CEO and head designer Sean McMillan and managing director Nigel Stuart both flew out from the UK to attend the show to discuss Spirit’s portfolio of modern classic yachts and support the Spirit Asia office at their debut show. Designed as a performance orientated sailing sloop, Chloe Giselle combines classical elegance with lightweight construction, excellent engineering, the finest equipment and a superbly fitted interior. Offering a balanced blend of style and practicality, she provided the perfect backdrop for three days of sailing and lifestyle photography. Prior to the photo shoot Spirit and Devon based clothing brand Quba discussed an opportunity for a partnership between the two companies. With shared values of high quality, tradition and style, Quba and Spirit agreed to collaborate on the project, which is hopefully the first of many joint ventures. The three day photo session included images of the yacht interior and at anchor, as well as a long and fickle day’s sailing in very light winds at sunrise and heavy winds and rain at sunset (many thanks go to Wally for the loan of a tender as the photographer’s boat). The full range of images will be released throughout the year; keep an eye out for preview shots on our website, Facebook and Twitter pages.